Started as a simple t-shirt company (http://shop.thes4p.com), Sorry For Partying quickly grew into a lifestyle brand with a community of highly engaged fans who love to party. In the past year, our FB grew to over 40K (http://www.facebook.com/TheSorryForPartying) fans while maintaining 95%+ fan engagement with $0 spent in marketing to date. We recently launched out twitter strategy with followers growing at a rate of 1-2% per day. 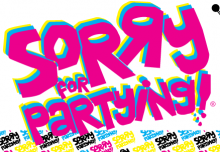 Revenue was up 400% in 2011 (still only selling online, direct to consumer), we had another year of high growth in 2012, and we locked down a bunch of IP around the phrase "Sorry For Partying." We are building (monetizing) our brand through merchandise, digital content, some more digital content, and events. Each year, a batch a seniors graduate, and new a batch a freshmen come in. As long as partying is an important part of college, we have a market. [#4] People want to connect with other people in a context where they know they are going to have fun and increase their social capital by finding and sharing something valuable. • Sharing – if they have a positive experience with a product, they will share it with their friends.